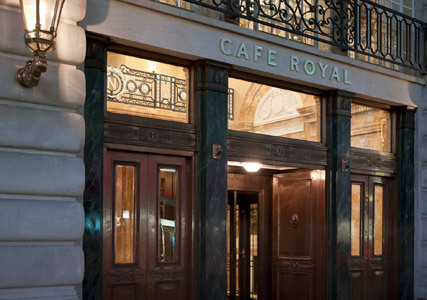 We’ve all heard the glamorous and hedonistic tales of Cafe Royal’s glory days. There was the time that Oscar Wilde got so wasted on Absinthe he thought he was in a field of tulips, the well-documented night that Lou Reed and David Bowie shared a kiss, and we love the romantic old-school vision of Elizabeth Taylor and Richard Burton on a glamorous date night. Having closed in 2008 and undergone a £90m redevelopment, Cafe Royal has been transformed into a 159-room luxury hotel, so we went along for a preview tour and to try out the new Ten Room restaurant. Designed by Sir David Chipperfield, the hotel has managed to keep the beautifully ornate and lavish details of the original buidling. The rooms are contemporary, with baths carved out of solid stone, floors made of oak and copperlight doors. And, despite being set right in the heart of Piccadilly, not a peep could be heard from the predictable West End chaos outside. The wonders of high-tech sound-proofing and powerful double-glazing. The newly restored Grill Room is a must-visit, after all this was precisely the spot where Wilde fell in love with Lord Alfred Douglas and the Beatles, Mick Jagger and Elizabeth Taylor danced the night away. The ornate Louis XVI detailing has being perfectly restored giving the room a real sense of history and luxury. There is a smart dress code for the Grill Room, which is now a champagne and caviar lounge, and a jazz pianist and singer will play Wednesday to Saturday. My man friend and I were one of the lucky few preview guests to dine at the Ten Room restaurant, a new brasserie set just away from the frantic bustle of Regent Street. The waiters were keen to impress and were very attentive. The menu was varied with traditional English fare served alongside lighter pan-Asian dishes. The menu was as good as any top-end restaurant I’ve eaten in and the wine was perfectly quaffable. What the Ten Room did lack was buzz and atmosphere but I have no doubt that this will have all changed now that the doors are officially open.